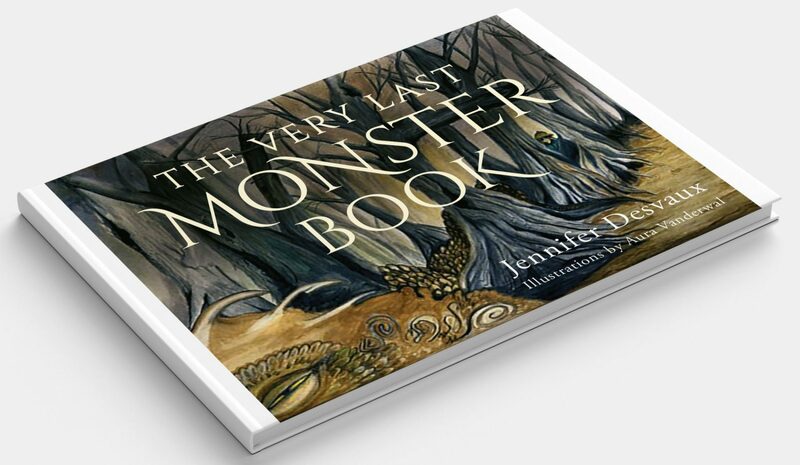 The Very Last Monster Book has been causing a lot of excitement in the press. 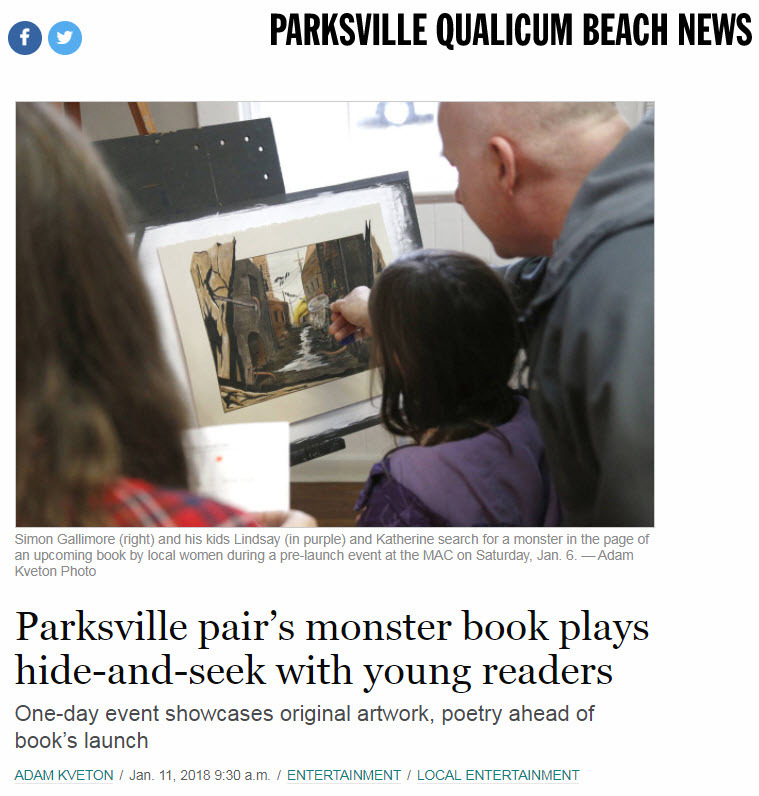 Young readers and monster enthusiasts, some dressed in safari hats and others sporting binoculars and magnifying glasses, gathered at the MAC on Saturday, Jan. 6 to find themselves some beasties. 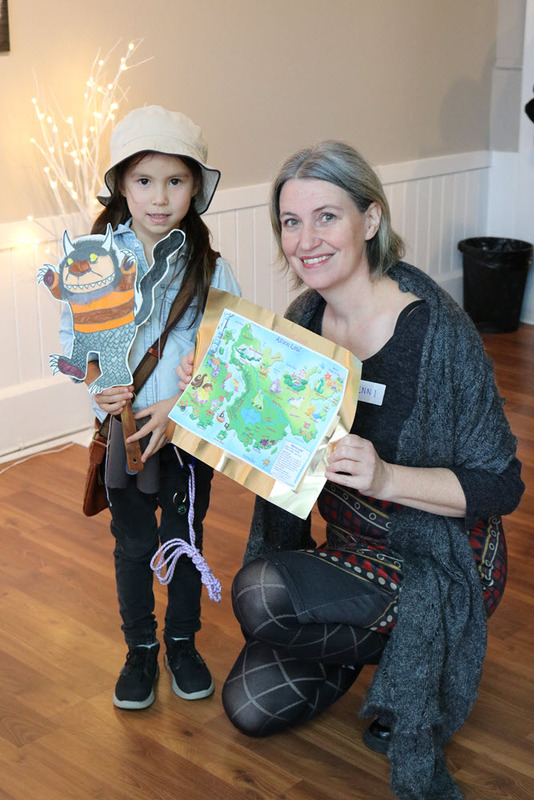 The local author and illustrator team of Jennifer Desvaux and Aura Vanderwal took a different approach to a book launch event to get kids excited about their project, The Very Last Monster Book. Echoing the mostly hidden monsters in their book, the finished book itself was nowhere to be found at what was actually a pre book-launch event that aimed to introduce children and families to the project, get them excited for it and register for a copy. The event had the original artwork and poetry that make up the book on display, and asked attendees to dress up in their best monster-tracking gear to locate the rare monsters (one hidden on each page in a sort of Where’s Waldo fashion) and earn a certificate. Children, parents and grandparents were lined up ahead of the event’s start time to see what it was all about, while Desvaux and Vanderwal said they were excited to see what would happen. While Desvaux said she can imagine well-established books doing an event like theirs, she said she was excited to turn that on its head. “That this is how we are going to start it, by celebrating it as a piece of art, both the words and the imagery. “I would love to spare millions of dollars just to be able to run with it, but I like the fact that people get interested and committed up front, and then they are invested in it as well,” said Desvaux. Of beginning the book, Desvaux said she woke up from a dream with the first three stanzas in her head. Though Desvaux had written stories before, this is the first one she shared, eventually with Vanderwal, a friend of hers. 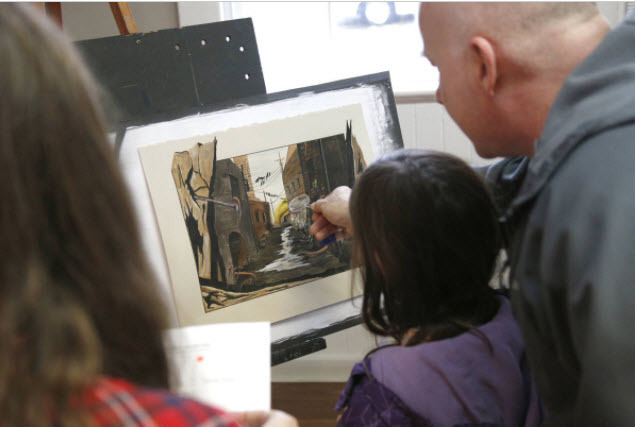 With a background is portraiture, Vanderwal asked if she could take a crack at illustrating a page. “One by one, it just came together perfectly,” said Vanderwal. 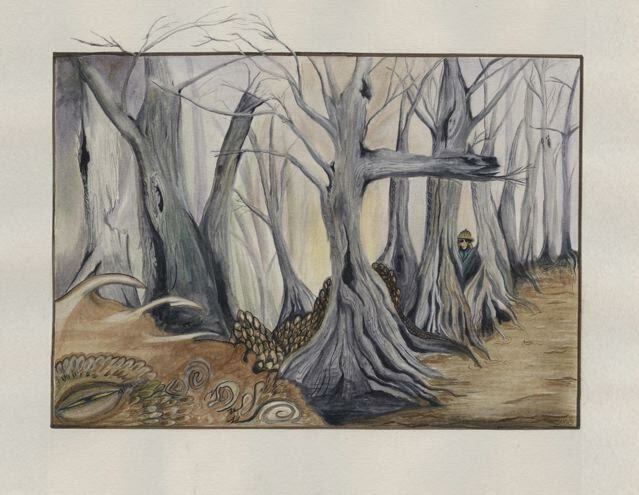 Illustrated using several media, but mostly watercolour, the images portray colourful, varied environments (described by Desvaux in her poems) in which monsters are hidden (some more craftily than others, but each leaving most of the monster obscured). Other themes in the book include environmental stewardship and endangered species (the monsters being quite rare). Nonetheless, what Desvaux said she hopes kids get out of the book is a love of language and art, and that the effect is lasting. For more information on the book, and to register for a copy, go to lastmonsters.com. 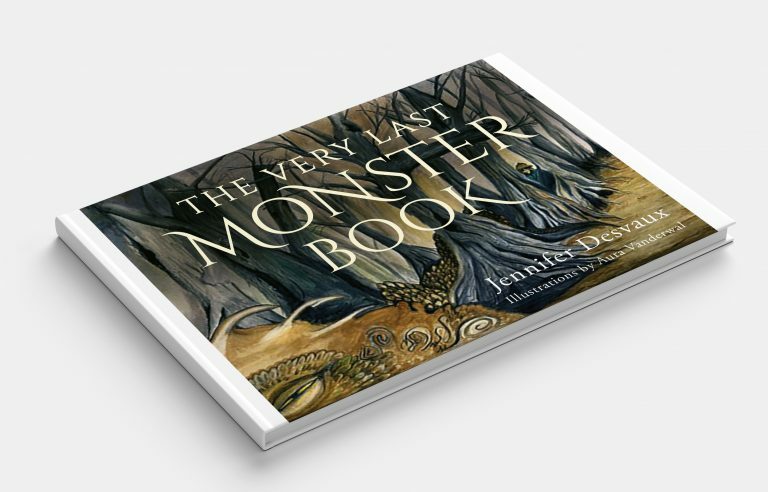 The Very Last Monster Book – Join the Search! See the World Premier exhibition of the Words and Original Artwork for the forthcoming launch of The Very Last Monster Book. Meet author Jennifer Desvaux and illustrator Aura Vanderwal. Bring your camera! Fancy dress for the kids. Prize for the best “Last Monster Explorer” costume. Bring your binoculars, magnifying glasses, maps and more…! SIGN UP to get notified of news and the book release. Please also report any monster sightings in your inbox.